Rudrakshas have fascinated people across the world due to its mystical powers. For thousands of years, many spiritual traditions have benefited from rudraksha beads which are believed to radiate beneficial energies for overall healing, and rendering positive changes in the one who wear them. Rudrakshas have medicinal and healing properties. Because of this it protects the wearer from several diseases and negative influences. These are also used in Ayurveda for curing diseases. The different faced rudrakshas are said to be governed by different planets and therefore are also worn as an astrological remedy to evade malefic effects of Planets and for maintaining good health and fortune. Rudrakshas are very sought after powerful and auspicious beads that helps one attain success in all that you want in life – a healthy body, mind and soul, gain knowledge, wealth, fame, fortune and achieve happiness and eternal bliss. These beads eliminate stress and imbue its wearer with tranquility, concentration, peace of mind and focus – the states of mind that are important for success to everyone especially professionals and students. It alters personality and mindset of people in a positive way and helps the wearer to achieve spiritual and material growth. They have immense powers in boosting energy levels and confidence, orienting mind towards prosperity, instilling feeling of security, improving the ability to relate with others easily and increasing the ability of speculative thinking. The anti aging property of Rudrakshas have also been well experienced. The word Rudraksha is derived from the words Rudra + Aksha (Rudra is the name of Lord Shiva and Aksha means Tears) meaning tears of Rudra, i.e., Lord Shiva. Details about Rudrakshas and their effects are mentioned in various Hindu Puranas like Shiva Purana, Devi Purana, Padma Purana and Rudraksha Jabalopanishad. As per Shiva Puran (Ref. 1), Rudraksha of the size of embolic myrobalan (Dhatriphal or Amla) is the best and the one having size of fruit of jujube tree (Badriphala) is of medium quality. The meanest (Inferior) variety of the bead is the one having the size of a gram. Rudraksha of even size , glossy, firm, thick and with many thorn-like protrusions yield the desired results. Six types of Rudraksha are to be discarded: those defiled by worms, are cut and broken, have no thorn like protrusions, have cracks and are not round. The one having natural hole is the best and the one in which it is to be bored through human effort is of medium quality. Shrimad Devibhagwat (Ref. 2) states: "A rudraksha with the size of embolic myrobalan is highly meritorious and is the best of all. A rudraksha bead of the size of ber (Jujube fruit) is of medium quality and the one the size of a gram is of mean quality. Lustrous and thorny rudraksha of equal size are the best ones. Thornless, worm eaten, uneven, non-spherical beads are forbidden. Rudrakshas having natural hole is the best and the one which requires human effort for making a hole is of medium quality. Rudraksha should be of spherical shape and if rubbed against any rough surface it should leave a gold-colored streak." Rudrakshajabalopanishad (Ref. 3) mentions that Rudrakhsa the size of Amla (Embolic myrobalan) is the best. The one having the size of jujube (Ber) is of medium quality and the smallest the size of a gram (Chana) is the worst. Therefore, one may conclude that the bigger-sized beads are better than smaller ones. It is clear from these three ancient epics that only round variety of Rudraksha having large size that of amla (15mm to 30 mm in diameter) are better and they should have a natural hole. Its surface should be thorny, hard and glossy. Due to the increasing awareness of the immense benefits and healing powers of Rudrakshas its demand is increasing day by day but, due to less availability of higher mukhi rudrakshas (11 to 21 Mukhi) and certain rare Rudrakshas like Ganesha, Gauri-Shankar and Sawar, various means are being followed to fake them (Like tampering with the outer shell to create artificial extra mukhis or joining pieces of cheaper Rudrakshas to make it into a higher mukhi fake rudraksha. Totally artificial Rudrakshas are also very commonly being sold now-a-days). It is also very important to check the internal seeds, magnetic energy, Temperature test and Aura of the Rudrakshas to differentiate between ordinary and highly potent and effective rudrakshas. 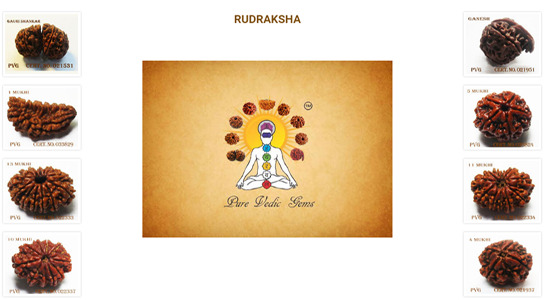 At Pure Vedic Gems all our Rudrakshas come from the oldest and the most reliable Rudraksha sources and go through stringent tests from reputed Labs of International standards for all the above mentioned parameters. After being certified, each and every Rudraksha is purified and energized by the Ancient Rituals (Rudra Mantras) in our monthly Rudrabhishek pujas. This assures our Rudrakshas to be one of the best quality, genuine and most effective to achieve their desired benefits, (and due to our direct sourcing) at the most reasonable and affordable prices.